"If you can't find eggplant, this is wonderful in zucchini, too!" Scoop the pulp from each eggplant, reserving the shells. Place pulp into a pot and cover with salted water; bring to a boil. Reduce heat to medium-low and simmer until tender, about 10 minutes. Drain and transfer eggplant to a large bowl. Heat olive oil in a skillet over medium heat; cook and stir onion and bell pepper until tender, 5 to 10 minutes. Add shrimp; cook and stir until cooked through and pink, 3 to 5 minutes. Remove skillet from heat. Mash eggplant thoroughly; add shrimp mixture, tomatoes, butter, and egg and mix well. Stuff eggplant shells with eggplant-shrimp mixture; season with salt and pepper. Top each stuffed eggplant with Cheddar cheese. 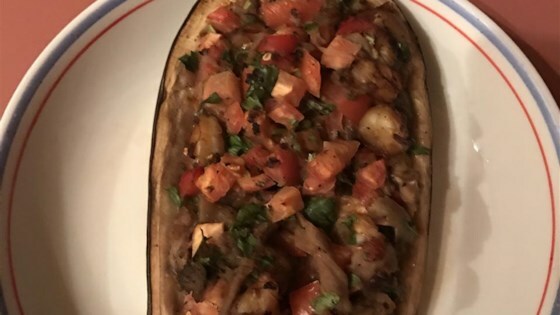 Place stuffed eggplant in a baking dish. Bake in the preheated oven until filling is cooked through and cheese is bubbling, 20 to 30 minutes.